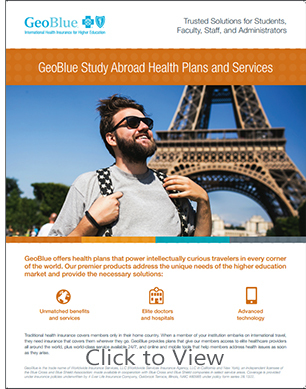 Administrators, Students, Faculty and Parents - GeoBlue plans, sold in the U.S. in collaboration with participating Blue Cross and Blue Shield companies, help students, faculty, staff and administrators identify, access and pay for quality healthcare all around the world. We are a global society and there is no place it shows more than on the college campus. Students from all over the world are seeking higher education and in many cases they are seeking it abroad. So too are faculty and administrative members of these higher education institutions. And then there are the parents of these global students and like the student, faculty and administrative member they seek access to information that can help them maintain the overall health of their most precious possession, their child. So much goes into a comprehensive solution for those students whom elect to study outside their home country. Students want to explore new cultures, meet new people and learn about new countries and their customs. Traveling and studying abroad does not come without risk. Should your student need medical attention, you want them to have access to the best possible care. 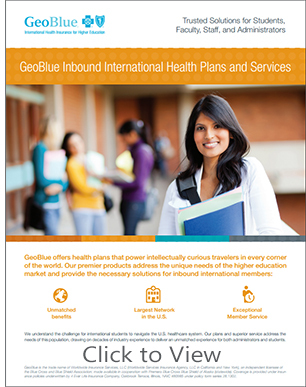 GeoBlue health insurance for students visiting the United States or studying in another country provides the best coverage and resources for international travel, coupled with industry-leading, concierge-level service to help members access medical care that meets their needs. Embarking on a study abroad program is an exciting venture that opens up the mind and gives students, faculty and staff a broader, global view of the world. GeoBlue brings peace of mind to students—and parents—and lets them focus on experiencing a rich, new culture. Inbound International Travelers - Students traveling to the United States have access to a countrywide network of over 700,000 preferred healthcare providers, including 4,000 hospitals. And, GeoBlue’s concierge-level service means you can easily reach us with one call – whether it’s a question about routine healthcare or a life-saving medical need. For non-U.S. students enrolled in U.S. institutions of higher learning, GeoBlue makes students’ transition to the United States smooth and gives them peace of mind during their visit. GeoBlue's core strength is service, and they work with international students to ensure they stay safe and healthy while they’re in the States. Parents of Global Students - Easy Access to Healthcare Anywhere in the World. Help your student manage their healthcare no matter their location. Find hand-picked healthcare providers, request appointments, and view claims and plan details. Travel Alerts and Country Information, Stay on top of the latest travel alerts, health information and political climate details no matter where your student travels. Sign up for automatic updates and emails. Faculty and Administrators - Convenient Account Tools. Review your institution’s plan details, build and manage travel rosters and enrollments and view and run reports, transactions and plan-specific information. Assist students by downloading claim forms and student ID cards. Powering Travelers Around the World, No matter where your students and staff are traveling, service travels with them. 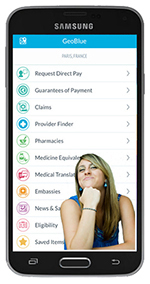 Your travelers can easily access healthcare services, claims information, medical translation services and travel alerts Online or from the GeoBlue app. 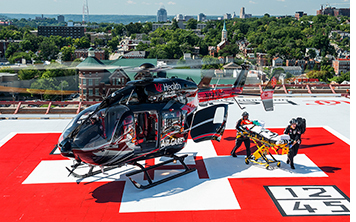 When a member is in a medical situation that requires an evacuation, GeoBlue will coordinate all the emergency services with the help of our global partners and Regional Physician Advisors. With the support of this medical team, we can overcome obstacles and limitations to ensure members get the highest level of care. In the event of a political event or natural disaster, GeoBlue will engage the resources of our security partner, Drum Cussac, to arrange evacuation and supporting services. Drum Cussac is a leading international risk management advisor responding to up-to-the minute reliable information, analysis and intelligence to help make informed decisions and operate with confidence in any situation around the globe. GeoBlue’s unsurpassed Online and mobile resources promote personal safety by giving members convenient access to vitally important tools and news. This information includes daily alerts detailing the latest security and health issues in specific destinations. It also provides country and city profiles on crime, terrorism and natural disasters. If you are an educational institution with a student body that is made up of both Inbound International Students and Study Abroad programs then let us help you find a solution to your needs. GeoBlue offers both Institutional based group plans for a larger student body as well as solutions for the individual student. For smaller Schools, both high schools and college level the GeoBlue Navigator for Students is the Flagship programs for the Study Abroad student. Call +1 (307-690-0427 or email us at "Sales@Individualhealth.com". We are here to help!